This is not a photograph! 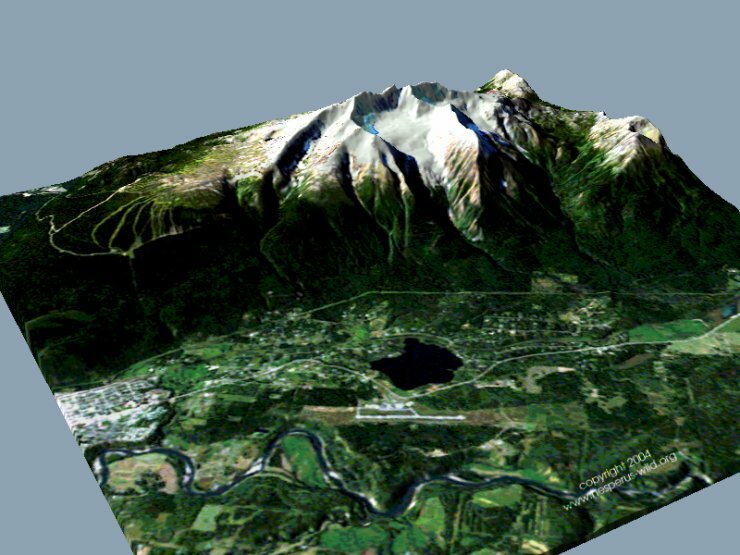 This 3D scene was generated by 3DEM, using a Landsat 7 orthoimage overlaid on a digital elevation model from CDED. Hudson Bay Mountain (elevation approximately 2500m) is in the centre background,with Smithers, BC (elevation approximately 500m), in the lower left. The Smithers airport is in centre foreground, with Lake Kathlyn just behind it and the Bulkley River just in front of it. The road that snakes between the lake and the airport is Trans-Canada Highway 16. The prominent line across the base of the mountain is a powerline. The ski runs of Ski Smithers show up left of the peak. North is to the right in this image. The Landsat image is a true-colour composite of bands 1, 2 and 3, taken on 15 September, 2001. Projection is UTM Zone 9 N.